Looking for something inspirational to write about, my honey encouraged me to check out Neil Gaimanʼs outstanding and massively popular blog. I wish I hadnʼt. Iʼm still pretty raw dealing with my daughterʼs devastating emotional upheaval; no, she hasnʼt just gotten back from Afghanistan, but in her way and for all of us, her own private war still rages on. She has been home for four evenings and counting… so in reading the reﬂective postings of arguably one of our time’s great authors, and watching Because the Origami, a Vimeo post by Ben Jacobson, I felt as snifﬂy as Mr. Gaiman. The story in the song could be my own one day, but thankfully, not today. Instead, today I wish to give thanks for the wonderful Saturday spent at this weekendʼs Mamapalooza Festival in the shadow of the Kensico Dam in Westchester County, New York. Despite the delicate dance between feeling all right one second and overwhelmed the next, worrying that something will tip my little girl back to the “other” side of safe and sound, I was able to settle in and meet an amazing group of like-minded souls — and for this I am grateful. Because of our family drama, I didnʼt commit to attending Mamapalooza until several days ago, but somehow everything came together — as it usually does. This is the part where I sing the praises for Vistaprintʼs speedy banner, brochure and business card printing. With their great service I was ready to go in less than a week. I read somewhere that more than 5,000 people could be in attendance but the foot trafﬁc at beautiful Kensico Dam Plaza was light so now I have enough materials to do a half-dozen more festivals and fairs. Whatever. Regardless of my zealous over-printing of materials, I really enjoyed myself. I met some amazing local vendors, connected with old friends who came by, and schmoozed with lots of interesting people who passed by my awesome, crystal-laden, bold and beautifully-bannered booth. By the end of the day I had another 30-40 people signed up on my mailing list to receive information about my upcoming Divas-Night-Out event May 26th and a full rafﬂe jar of interested potential past life regression clients. Have You Hugged Your Inner Diva Today? So, all in all, I have to admit, it was more than a successful day, it was a joyful one. A special shout out to Joy Rose, Pres. of Mamapalooza, Paula Caracappa, new producer of the festival, and the amazing Connie, along with all of the other staff and volunteers who made the event so fabu. The rain was a non-issue, my freshly purchased tent worked like a charm and I have lots of new high-vibe contacts, great memories, photos and video excerpts my honey shot. (When heʼs done editing it together, Iʼll post it). The only thing I wish I had more of would be the delectable chocolate samplers from the Melting Pot restaurant in White Plains, where my next Divas-Night-Out event will be taking place. The strawberries, brownie bites and chocolate dipping sauces were mind blowingly awesome, but really what made them even more delicious was the fact that I got to share them with my little girl. It doesnʼt get much better than that. Catch Shira’s D.I.V.A program at the M.O.M. Conference and MamaExpo – May 23rd, 11-12:30 p.m.! 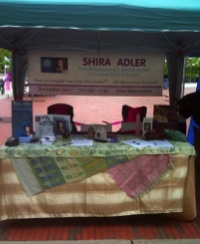 Want to join Shira at Divas-Night-Out on May 24? For more information, download her brochure here.